﻿ Grand Lake St. Marys State Park - Ohio. Find It Here. Originally constructed as a feeder reservoir for the Miami-Erie Canal, Grand Lake St. Marys was for many years recognized as the largest man-made reservoir in the world. 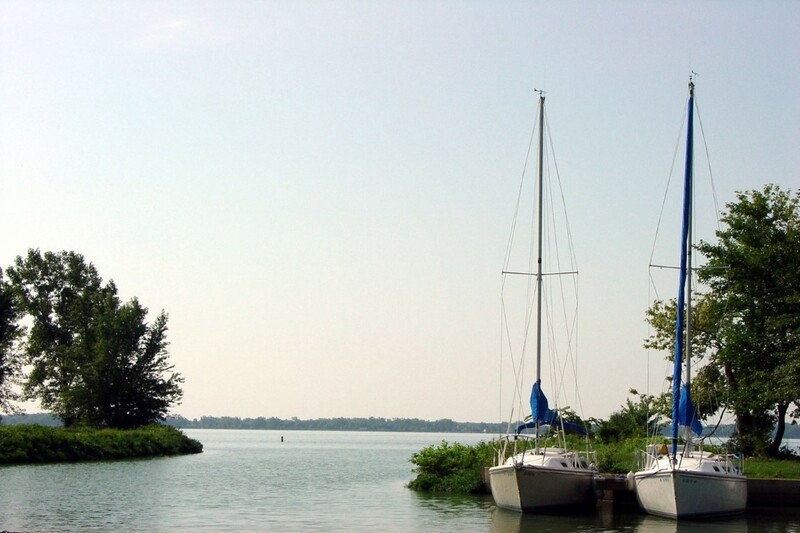 The 13,500-acre lake is the gateway to swimming, boating, camping and fishing in one of Ohio's oldest state parks.The area in and around Grand lake St. Marys State Park played an important part in the development of the Northwest territory. The St. Marys River served as a vital link between the Great Lakes and the Ohio River.In 1837, work commenced on a reservoir for the Miami-Erie canal to maintain the canals five-foot water depth. Workers using hand tools were paid 35 cents a day and a jigger of whiskey to keep malaria away. At its completion in 1845, 13,500-acre Grand Lake was the largest man-made lake in the world. The lake was connected to the canal by a three-mile feeder.The canal prospered until the coming of the railroads in the 1870s. The area experienced another boom in the late 1890s when oil was discovered. For a time the lake was dotted with oil derricks. Today a pile of rocks near the center of the lake marks the spot of the last producing well.Grand Lake St. Marys and other canal feeder lakes in the state were the first areas to be dedicated as Ohio state parks in 1949.